EyeWanto.com is a project developed for my thesis works at the Dynamic Media Institute at Massachusetts College of Art in the fall of 2011. 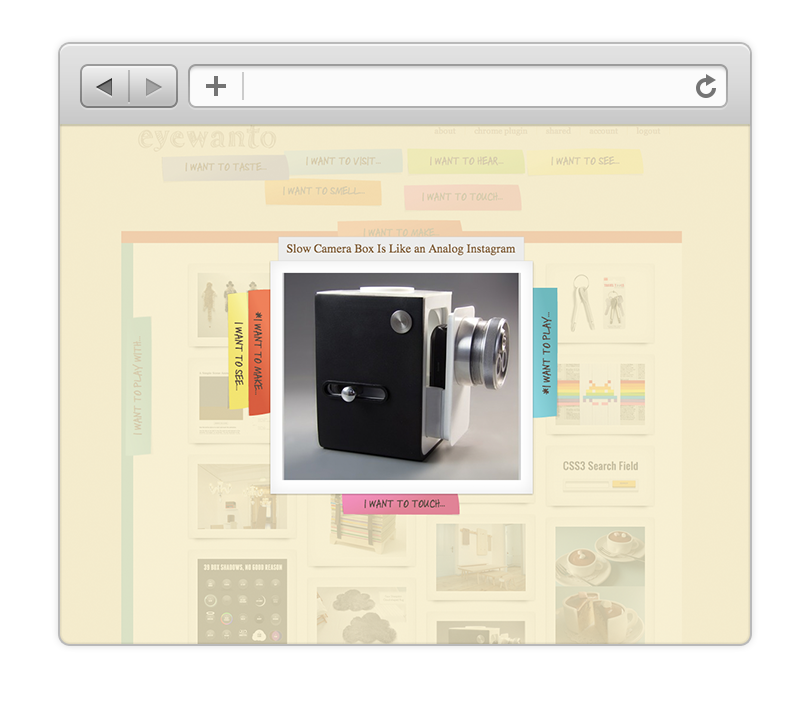 This visual browsing system allows a user to collect images, sites, and videos easily from anywhere online, tag them with meaningful categories and then browse through them at anytime to find visual inspiration. I enjoy visual browsing systems like Pinterest and FoodGawker, spending hours sifting through the images. I even use them as a place to share and organize some of my own inspirations. However, they have become a very public arena with many contributors adding endless tagging and categorizing options. The result is in an interface that lacks a level of personalization and can be complicated to navigate through. EyeWanto allows me to move my meaningless folders of interesting links and images into an application meant for personal collecting and browsing of visual content. There are only 9 categories (all sensory): "I want to touch…", "I want to taste…", "I want to smell…", "I want to see…", "I want to hear…", "I want to play…", "I want to make…", "I want to visit…". A user can easily add any image from a webpage with a browser plugin that collects the source, title, and allows you to tag and even post to tumblr. By minimizing my interface options and placing the focus on my collection of images I have created a personal space for myself that is emotionally moving and inspirational.